In a 3x3 grid, I'd have to put numbers from 1 to 9 in a manner so that respective row, column and diagonal add up to 15. Through some calculations and trial and error method. Is there any strategy or way of approach to this problem, or is trial and error method the solution to it? Start in the middle of the top row and enter 1. Move Up 1 and Right 1 wrapping both vertically and horizontally when you leave the grid *(see note below). If that square is empty enter the next number; if the square is not empty put the next number underneath the last number you entered. Repeat 2&3 until the grid is complete. All rows, columns and the two diagonals will sum to the same value. As the square square is symmetric there are eight symmetries. You can also get these symmetries by a simple variation of the start square and direction used in step 2. *Note: So as you are in the middle of the top row on the first move you want to place the next number in the next column of the row above. The row above does not exist so move to the last row of the square in the same column. If you were in the last column you would move to the first column. If you look at the example of the 5x5 at number 15. The next position is the square up and to the right of 15 which wraps on both the row and column to point to the lower right square which has 11 in it. As that square is not empty we placed 16 underneath 15. $$a+b+c=15$$ $$d+e+f=15$$ $$ g+h+I=15$$ $$ a+d+g =15$$ $$b+e+h =15$$ $$c+f+I=15$$ $$ a+e+I =15$$ $$ c+e+g=15$$ I would place these in excel personally. So adding equations $2,5,7,8$ and then subtracting equations $1,2,3$ yields $3e=15$ so $ e=5$. No others are solvable without guessing one but from there you just solve them one at a time. Guess $1$ is in a corner, requires $9$ in the other corner. There must be two pairs which add to $14$. The only one is $8+6$ so $1$ cannot be in the corner. Guess $1$ not in a corner, $9$ must still be opposite to it. $8$ and $6$ must be in the adjacent corners. The other corners can be solved by the diagonal equations ($2$ and $4$). Finally the last two squares can be easily solved. There are only 8 different solutions and because this logic eliminates any others; they are all mirrors/rotations of the one you already posted. …then make cross lines as shown in the picture below. Then it becomes 3x3 boxes. For the remaining boxes, put the number which is opposite to the box. Another approach is to consider the ways to obtain 15 as a sum of 3 different numbers in the range 1..9. These are: 1+5+9, 1+6+8, 2+4+9, 2+5+8, 2+6+7, 3+4+8, 3+5+7, 4+5+6. As you can see there are only 8 ways, and you need 8 different sums in your square. So each sum appears exactly once as a line in your square. 5 must be in the center because it appears 4 times. Only the center belongs to 4 lines. 2,4,6,8 are corners because they appear 3 times each. 1,3,7,9 are borders because they appear only twice. From there the solution is found easily. And it is unique. Not the answer you're looking for? Browse other questions tagged logical-deduction calculation-puzzle magic-square or ask your own question. How do I solve these 3x3 magic squares? 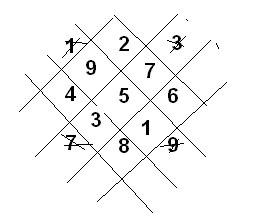 What is the fewest number of filled-in squares required to uniquely define a magic square?